Renewable energy sources became one of the most appealing issues in modern industry, as they benefit both global economy and social livelihood. A big number of countries has already realized successful projects of solar, wind and tidal power plants, using the possibilities provided by local natural conditions. Mostly it is related to highly developed states, which possess technological achievements and great financial support, but, surprisingly, they do not refuse from usage of fossil fuels flatly. In fact, renewable energy is not so constant, as people may think. There are some seasonal and even daily changes, which obstruct total reliance on solar or wind stations. In purpose of their rational usage, certain countries constructed hybrid power stations that unite energy generation from different sources. Hybrid stations provide many advantages for their holders, either national authorities or small households. Indeed, they might be installed in private-owned housings by combining common solar panels and small wind turbines. If this “plant” is linked to general electric network, the holder can even be engaged in local energy trade. However, the advantages of hybrid power stations are better observed on countries’ examples. Capable of providing uninterrupted utility-grade power 24/7. In 2011 the first hybrid station based on two energy sources was established in Germany (Prenzlau town in district of Brandenburg). According to creators of the station, it is focused on maximum use of energy derived from wind; the excess power is focused on hydrogen production from water during nighttime, the period of minimum energy consumption. As one could guess, this is the example of wind and biogas complex energy generation and their reasonable usage. The other example features a small hybrid station in Israel, where the solar power and natural gas, traditional energy source for now, play a prior role. 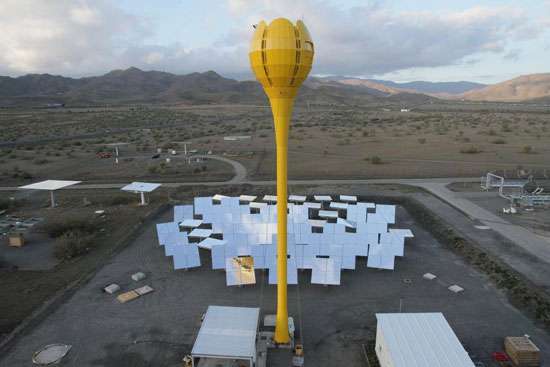 It consists of 30 solar reflectors that “catch” the sunlight, focusing it on a “flower” tower, which converts it in solar energy. To preserve stations’ capacity permanently, solar devices are disabled at night, as gas turbines start working. In addition, if the weather is cloudy, the station can work on biogas, biofuel or gas. The hybrid station of such type is suitable for distant places, where there is no general electric network. To date it provides energy for nearly 70 households, but creators of the project, Aora Company, promise to implement it in other areas. In 2011 there was an announcement of hybrid station in Azerbaijan. The idea of this project points out a generation of solar and wind energy, supplemented by energy of recycled biomass. Many multinational companies shared an interest in development of a new plant, including Siemens. The only thing causing doubts is biomass “compound”; wind and solar power, on the contrary, pose no problem in Caspian region. If the hybrid station is successful, Azerbaijan will construct several offshore wind stations in Caspian Sea. All in all, hybrid power systems are referred to as perspective ones nowadays regardless provided examples. Such technologies might be considered as a transitive stage between usage of traditional fuels and larger distribution renewable energy sources, the long-standing goal of global society.